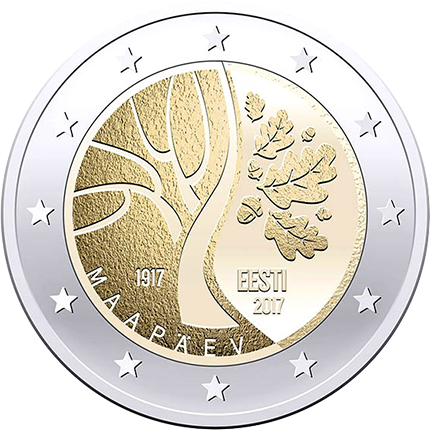 The supervisory board of the Bank of Estonia announced (31st March) that the winning design for a new 2017-dated €2 coin, which will be issued in celebration of the country’s centenary anniversary of independence, has been chosen and unveiled. The winning design for the €2 commemorative was chosen from 32 entries. The winning artist, Jaan Meristo (who will receive a price of €2,000), dedicated the design to the events that preceded Estonia’s independence. These events include the collapse of the Russian Empire, which was brought about by the surprise abdication of Czar Nicholas II in March 1917. 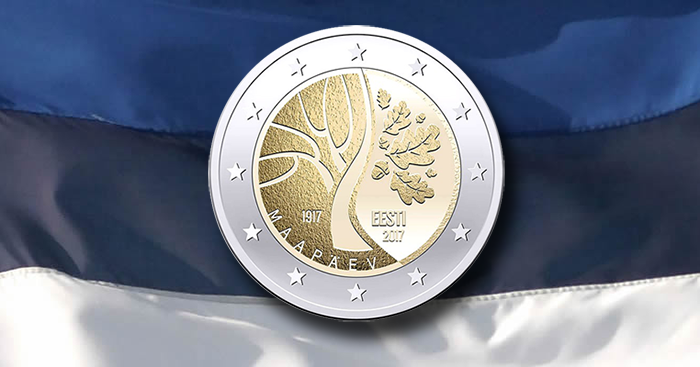 The design for the €2 commemorative coin depicts oak leaves, bare oak branches, and the trunk of an oak tree. The winding oak symbolises Estonia’s road to independence; the bare branches relate to the year 1917; and the leaves symbolise strength, achievement, and longevity, and also feature on the great coat of arms of the Republic of Estonia. The word MAAPÄEV (Assembly) is placed to the lower left of the main design. The €2 commemorative coin will be produced as a circulating coin with the common reverse side of the eurozone. One million, five hundred thousand coins have been authorised and will enter into circulation in the second half of the year, at which time the coin will be legal tender throughout the euro area. A collector’s version is also expected to be announced closer to the actual date of issue. Please visit the e-shop of the Bank of Estonia’s website for more information on this and other coins the bank issues. The startling events in far-away Sarajevo in 1914, and the unexpected abdication of Russia’s all-powerful Czar Nicholas II in March 1917, became the primary events that led to eventual statehood and independence for not only Estonia, but all three Baltic nations. The events occurred during a war in which the Russian government was embroiled in fighting against Imperial German and Austro-Hungarian forces versus the Allied armies of Great Britain and France. The escalating conflict was in support of their brethren in the Slavic kingdom of Serbia, bordering the powerful Austro-Hungarian Empire. The war was declared by the Imperial government of Austria-Hungary against Serbia after the assassination of the heir to the dual throne, Archduke Franz Ferdinand, along with his wife, Sophie, in the city of Sarajevo during a working visit in 1914. Sarajevo was then part of the vast Austrian Empire, and the assassin was a Serbian nationalist who had been known to authorities as an anarchist and member of the Black Hand secret military society. The killing was premeditated, and although an initial attempt had failed that very day (with a grenade thrown at the procession of automobiles carrying the Imperial couple), the gunman, Gavril Principe, eventually succeeded in his mission to gun down the archduke and his wife. The Imperial couple were driving to the hospital to meet with those who had been injured earlier by the grenade. When the car was stationary in front of a cafe where Principe had been sitting, he took a revolver out from his jacket, pointed the gun, and fired. These events led to declared defence treaties between various European powers, including Russia, who came to the defence of Serbia as Austria-Hungary and their German brothers declared war on the Balkan kingdom. Great Britain and France also came to the defence of Serbia, and as allies of Russia, were brought into the war, especially when Germany invaded Belgium as a means of surrounding French troops. Despite the fact that the crowned heads of state of the two most powerful countries were in fact first cousins and, previously, had been dear friends—addressing one another as “Dear Nicky” and “Dear Willy”—the fighting increased, and although Russia had initially seen some gains against Germany with the earlier battles, it became clear that Russia was woefully outmanoeuvred in terms of equipment and sophisticated weaponry. The tides turned quickly, and Russia suffered very heavy losses. Much of the poor performance on the part of the Russian forces was blamed on the czar, who had assumed direct command and had also travelled to be at the front line of the fighting. The czar’s wife, Empress Alexandra (a former German princess), was in charge of the government and was suspected by the Russian people of being a German spy. By early 1917, members of the czar’s closest advisory council were urging him to abdicate in favour of his younger brother, Grand Duke Michael, and go into exile with his family. On the 15th March 1917, under immense pressure both on the front line of the fighting and at home, Nicholas II abdicated in favour of Grand Duke Michael and announced his plans to leave Moscow and St. Petersburg. Grand Duke Michael refused the throne only hours later, and with this declaration, the Russian Duma—who had announced a provisional government under the direction of Georgy Yevgenyevich Lvov two weeks before the czar’s abdication—officially came into force. For Estonia, these events were regarded as nothing less than life-changing for both the people and the fledging nation. With the reality of the collapse of the Russian Empire, the need to unite, organise, and consolidate the territory of Estonians was crucial. During its entire time as part of Imperial Russia, what is now present-day Estonia had been divided between two governorates: the primary state of the Governorate of Estonia in the north, which essentially corresponded to the area of what was once Danish Estonia; and the northern portion of the Governorate of Livonia, which had a majority of ethnic Estonians. These two areas were amalgamated on the 12th April 1917 by administrative reforms of the Russian Provisional Government. The move proved very helpful to Estonians, since these events led the new Estonian autonomous government to take measures that included the organisation of the Estonian Provincial Assembly, or Maapäev. This body was elected after Russia’s February Revolution in 1917 as the national diet of the Autonomous Governorate of Estonia in the Russian Empire; now, with the coming together of two halves, it became the sole authority of one unified state. The provisional parliament, or Maapäev, included the Menshevik (or Russian Socialist) and Bolshevik factions of the Russian Social Democratic Labour Party, which took a share of the vote. On the 5th November 1917, just two days before the October Revolution in Saint Petersburg, Estonian Bolshevik leader Jaan Anvelt led his leftist coalition in an anti-democratic coup in Tallinn. 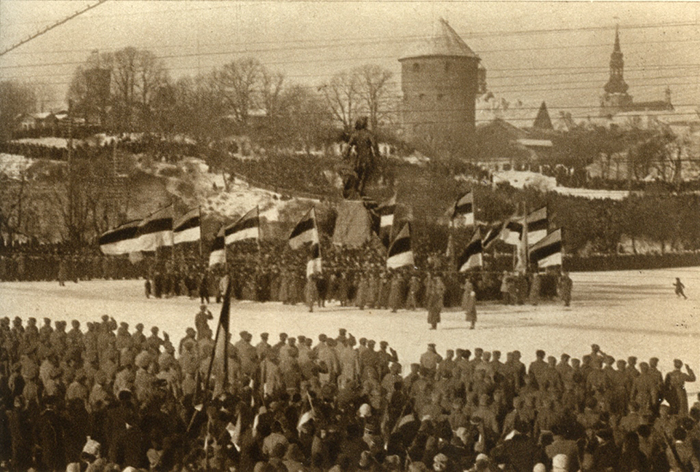 He had attempted to usurp political power from both the governorate and the provisional governor Jaan Poska, but, on the 28th November, the Maapäev refused to recognize the attempted Bolshevik coup d’état, and proclaimed itself to be the only legally elected and constituted authority in Estonia. Their efforts, however, led them to be driven underground by the Bolsheviks, who tightened their control on the Estonian state, still in the crosshairs of fighting between Russian and German armed forces.